Drowsiness is a separate state, in between sleep and wakefulness, and sharing some of the characteristics of both. We all pass through the drowsiness state on the way to sleep – it is not a dangerous state if you are sitting watching television, but is if you are flying a plane or driving a car. right from its earliest stages. Drowsiness means you could be just moments from sleep. Don’t lose sleep over the safety of your employees. Fatigue, but more specifically ‘drowsiness’, which is the dangerous state before sleep, combined with a hectic work schedule can wreak havoc on an individual’s health and safety. Shift workers are most likely to suffer injuries and illnesses caused by drowsiness, as they are the type of workers who tend to work against their natural body clock. Generally, shift workers have to fight against their circadian rhythm in order to stay awake during the night – when they are programmed to sleep – and sleep during the day, when they are programmed to be awake. So how do you self-manage drowsiness if the state of being drowsy is one you actually have no control over? Drowsiness has previously been difficult to detect. Speed, blood alcohol concentration and seatbelts have all been tackled by policy and legislation; however measuring a person’s drowsiness has to date been impossible. Therefore, legislation has been limited to log books and other subjective tools. Optalert has now overcome this problem through developing the early warning drowsiness detection system that measures drowsiness on the patented Johns Drowsiness Scale (JDSTM) The scale is similar to blood alcohol and can determine an individual’s alertness level and how likely they are to move to the dangerous state of drowsiness. Drowsiness and fatigue are often used interchangeably, however it is ‘drowsiness’ that is the dangerous state between alert wakefulness and sleep. Feeling fatigued could be likened to feeling tired, exhausted or low in energy, but often does not result in sleep. Think how you would feel after an intense gym session. People who are drowsy, however, are in that stage right before sleep. Regardless of whether you are curled up on the couch or on a long drive, if you are drowsy, you are at risk of falling asleep. And you can’t fight sleep. We have all seen the road toll stats and we understand the consequences of pushing ourselves to the limit, but in a world of increased push for productivity and decreased sleep, it is imperative that worksites include an early warning drowsiness detection system to protect their workers, vehicles and machinery. In 2018 Dr Murray Johns, introduced the term blepharometry, which refers to the unique study of eyelid movements. Utilising infrared reflectance, electro-oculography or video blepharometry, eyelid movements can be objectively quantified. Optalert’s technology uses blepharometry and patented algorithms to accurately quantify drowsiness or wakefulness, against the validated Johns Drowsiness Scale (JDS TM). The JDS is a 10-point scale; a score of 0 = ‘very alert’ and 10 = ‘very drowsy’. The JDS is used to define the exact level of drowsiness experienced by operators using Optalert’s early-warning drowsiness detection products. Peer-reviewed research has shown as levels of drowsiness increase, the risk of performance failure also increases. The term ‘performance failure’ refers to the inability of a person to respond appropriately, such as failing to respond to a visual stimulus (for example, responding to a stop signal) or failing to turn the wheel while negotiating a bend in the road. A drowsy driving crash will occur if a performance failure coincides with the need to perform a safety critical task. Independent research has shown JDS scores at medium risk levels indicate performance impairment equivalent to a blood alcohol concentration of 0.05, the legal limit on roads in many countries. 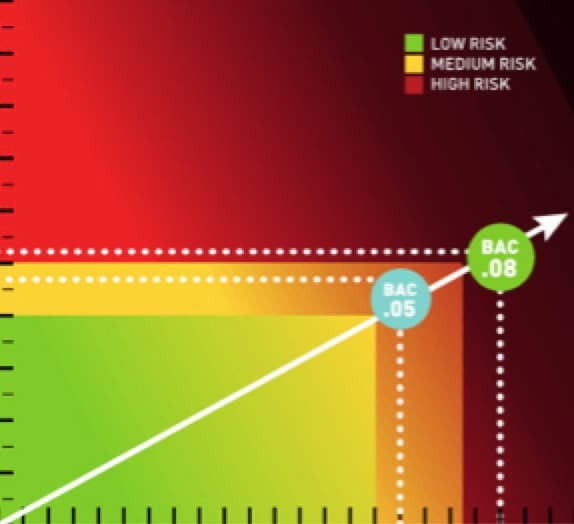 High risk JDS scores correspond to impairment equivalent to a BAC level of 0.08. These levels of impairment are similar to being awake for 17 and 21 hours respectively. Recent evidence has shown the JDS can be applied to other sensor technologies capable of measuring eyelid aperture, even at relatively low sampling rates. Optalert is also turning its extensive expertise in blepharometry, development of algorithms and generation of data, to identify the biomarkers for other degradations to neurological brain function, such as onset of seizures due to Epilepsy, ADHD, Parkinson’s, Alzheimer’s, alertness and motor neuron disease. What does a driver’s JDSTM score tell operators? The JDS is a 10-point scale developed by Optalert’s Founding Director, Dr Murray Johns, where a score of 0 = ‘very alert’ and 10 = ‘very drowsy’. It is used to define the exact level of drowsiness experienced by operators using Optalert’s early-warning drowsiness detection products, which means you can now put a number on how “tired you feel”. The ability to objectively identify the earliest signs of drowsiness removes uncertainty and subjective bias that can influence a professional operator’s judgment. Research shows that being awake for more than 17 hours can have the same impact on concentration and reaction times as a driver who has a BAC of 0.051. Like BAC readings, drowsiness can affect people very differently and while you may have had a good night of sleep the previous night, the cumulative effect of long periods of poor sleep could mean you should not be driving or making other critical decisions. The only real way to tell if a person is alert enough to drive is to accurately measure them while driving and the Optalert system not only does this, but it also gives early warnings to drivers who are at risk. The JDS scale, and Optalert early warning drowsiness detection products for measuring individual drowsiness, work together to give valuable information to show when a driver needs to stop driving. In 2003, Founding Director of Optalert and world-renowned sleep researcher, Dr Murray Johns introduced amplitude-velocity ratios (AVRs) for blinks as a measure of the relative velocity of their movements. His research found that in alert people, the amplitude (size) of upper eyelid movement during each blink is known to be very closely related to its peak velocity (speed). He also found the AVRs for the eyelid’s closing phase of a blink are different from those for the eyelid’s reopening phase of a blink, even though their amplitudes are usually the same. These ratios avoid the need for calibration of either the amplitude or velocity in absolute terms. The ratios are also very stable between people, which mean they do not have to be adjusted for individuals. AVRs have been shown to increase with drowsiness, particularly for the eyelids reopening, i.e. the upper eyelid moves more slowly when re-opening after a blink in people when drowsy than when alert. Through his research, Dr Johns developed the patented Johns Drowsiness Scale (JDS). He also developed the Epworth Sleepiness Scale (ESS), which is now a world-standard method for measuring a subject’s general level of sleepiness in daily life. The JDS was developed specifically for use with Optalert’s technology, which uses a system of infrared (IR) reflectance positioned in a sensor to monitor eye and eyelid movements, with particular emphasis on the velocity and duration of the upper eyelid during blinks. 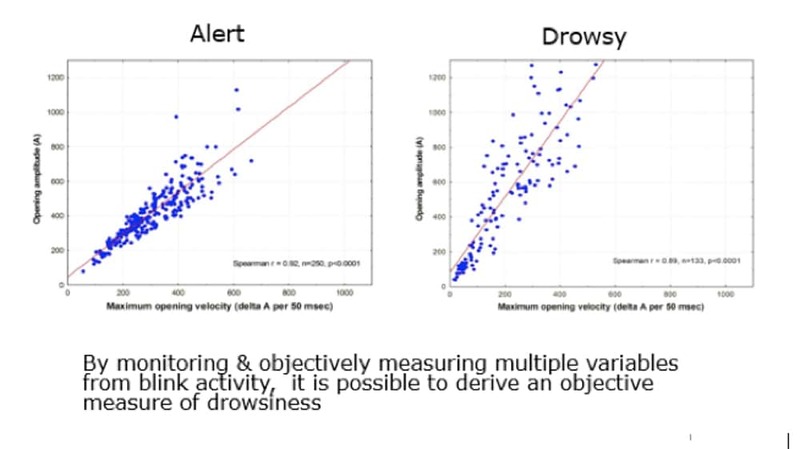 The system of IR reflectance has enabled several ocular variables to be identified that can be used in combination to objectively quantify drowsiness with the ten-point scientifically-validated JDS. Optalert’s patented JDS has now been developed further for the pharmaceutical industry. The Optalert BlinQ system is based on blepharometry and patented algorithms to objectively quantify drowsiness or wakefulness, against the validated JDS. This future-proofed approach to clinical development can advance clinical drug trial timelines and deliver new therapies to market faster. Optalert Founding Director Dr Murray Johns first developed the ESS for adults in 1990 and then later for children and adolescents in 2015. He developed the scale to assess the ‘daytime sleepiness’ of patients in his own private practice of Sleep Medicine, the Epworth Sleep Centre, and consequently named it after that Centre which he had established in 1988. The ESS is a self-administered questionnaire with eight questions. Respondents are asked to rate, on a four-point scale (0-3), their usual chances of dozing off or falling asleep while engaged in eight different activities. Most people engage in those activities at least occasionally, although not necessarily every day. The ESS score (the sum of eight item scores, 0-3) can range from 0 to 24. The higher the ESS score, the higher that person’s average sleep propensity in daily life (ASP), or their ‘daytime sleepiness’. Dr Murray Johns and the team at Optalert have now developed the biomarker for drowsiness. The next generation solution for objectively measuring drowsiness and wakefulness. Optalert is now transforming the way pharmaceutical companies are able to verify the efficacy of drugs in clinical trials. Through cutting edge research, Optalert has discovered the biomarker for drowsiness, an association between brain function and eyelid movement. A blink is the highly coordinated interaction of two muscle groups, the orbicularis oculi (OO) and the levator palpebrae superioris (LPS). Each muscle is controlled from different centres in the brain which need to operate in synchronicity. When drowsiness occurs, the tight controls responsible for their synchronisation deteriorates and this is evident in the blink characteristics. The Optalert BlinQ system offers a combination of real-world evidence and clinical data. Adaptable to various clinical drug trials and research projects, the optimized protocol recommends the Johns Test of Vigilance (JTV) tests be performed across a cohort of patients for reliable data outcomes. The use of Optalert’s innovative technology provides informative data sources to enable a greater level of patient understanding and a way forward to developing pharmaceuticals, faster.